INTERNET CAFÉ, BUDAPEST: One of the popular tourist attractions in Budapest is Szoborpark, an open-air museum on the outskirts of the city that offers a new home for some of the statues erected here during the the Stalinist era. 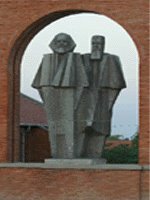 Only a few were designed to immortalise the greats of the communist movement, such as Marx, Engels and Lenin. Other 'celebrate the eternal friendship of the peoples of Hungary and the Soviet Union' or commemorate sundry Hungarian bureaucrats - men and women I consider to have been an exploitative and oppressive ruling class. These were the statues that got kicked over in 1956, as per the Redskins song. Most were rapidly reconstructed. For the younger of the tourists that go to gawp at the display, they are historical artefacts as remote from present-day reality as the exhibits from ancient Egypt I saw on a trip to Cairo last year. Indeed, the resemblance was more than passing. It is interesting just how little monuments to the greater glory of our rulers have changed in 3,000 years. I guess that flattering realist iconography is something of a constant. But what also strikes me is that many on the left get nostalgic for some of this stuff. I bet I wasn't the only leftwing student in the early eighties to decorate the walls of my bedsits with Soviet propaganda posters. I still have framed portraits of Marx, Engels and Lenin and the obligatory bust of the latter, souvenirs of a 1989 holiday to what was still the USSR. But that's strictly consenting adults in private stuff. Soviet retro chic even gets the occasional nod from street fashion to this day. Much of the socialist movement gets things utterly wrong by maintaining the use of this kind of imagery for agitational purposes. Hammers and sickles still decorate many of our banners and the mastheads of some of our papers. This is a PR disaster. For most workers, east and west, these are symbols of dictatorship, not liberty. The far left is going nowhere fast until it gets over this hang-up, ditches the graphic design of 100 years ago, and starts coming up with some persuasive new images that better represent our aspirations. It's just a shame we can't afford to hire a top ad agency to handle the make-over. Just to underline the use the right still makes of Stalinism, this afternoon I am off to the Terror Museum, housed in the former headquarters of the Hungarian secret police. The exhibition was set up by the former right populist Fidesz government, precisely to politicise the past for the edification of younger voters. Clinging on to orthodox symbolism is the greatest propaganda gift we could possibly hand these bastards.